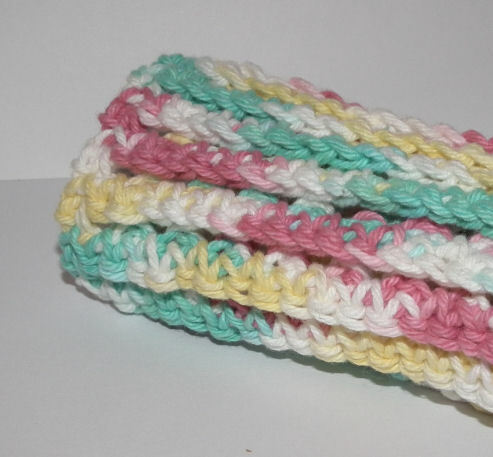 I had just finished a new cuff that used front post double crochets to create lines along the length when I thought "I wonder how that would look if I did a chain 1 space between each front post double crochet?" 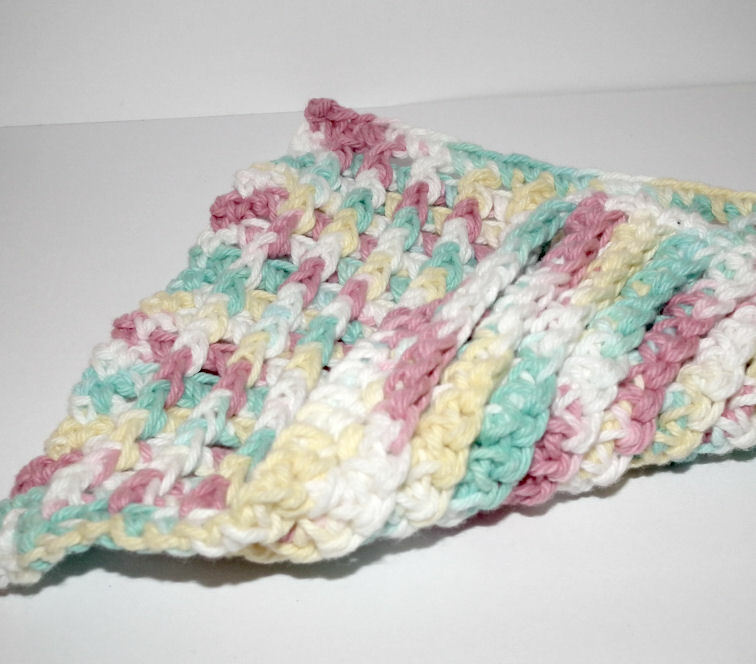 The result was a wonderfully textured fabric that I think would be ideal for dishcloths or washcloths. One side of the fabric has ribs, the other side has something like flaps, almost like shades at a 90 degree angle from the ribs. Here's a photo of the shade/flapped side. Close up of the ribbed side. It's all done by working back and forth in rows. No embellishment added after, and it's a very simple 2 row repeat after the first 2 rows. To work this stitch effect, you'll start with an odd number of stitches, and I think longer it would make an interesting scarf or could be used for other projects. Here's the instructions for the dishcloth as shown. I'd love to see anything you did using this technique. To work a front post double crochet- the post is the stitch, so instead of working the double crochet on the top of the stitch, you work the double crochet AROUND the stitch, so you'll yarn over, insert hook behind the stitch, and finish the double crochet. I don't ever count my turning chain as a first stitch, if you prefer to do it counting as the first stitch, by all means do. worsted weight cotton yarn- I'm not sure how much, I was working off a stash cone. Row 4: ch 1, c in last stitch of previous row, ch 1, fpdc around sc from row 2, repeat across working a fpdc around each sc in the second row until the last one, sc in first stitch of previous row to finish row. 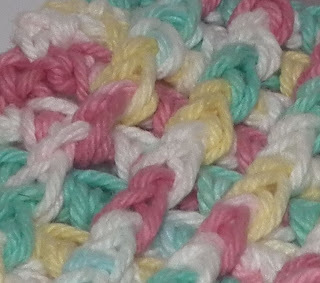 Break off, weave in ends, or you can work a single crochet around the whole block and weave in ends.